I’ve been crocheting this purse for years! In fact, I have one in black that I’ve carried forever. Introducing the Rippled Shells Purse! The variation on a shell stitch in this pattern is one of my favorites! The shell stitch is soft and feminine, and when you add the additional layer of texture in this shell variation, you get a pattern full of undulating waves and a scallop along the top edge. Beautiful! For more information about materials used, construction, and what’s involved, visit this page. Completely by accident I stumbled upon the perfect crocheted gift to give my girlfriends, sisters, mom and MIL, and other women on my gift-giving list. I was bored with all the usual yarns and projects that I’d been using for years and wanted to try something new. After 30 or so years of crocheting, a person gets an itch for something different, ya know? On a whim, I walked through the aisles of Hobby Lobby looking for some kind of yarn or thread I hadn’t crocheted with before. I stumbled across some Omega La Espiga Size 18, a spool of nylon cord that came in a handful of bright, fun colors. I had no idea what I’d do with it, but I was feeling adventurous! I grabbed a roll and took it home. After some experimentation, I realized the cord was pretty stiff and when crocheted, had a lot of body and structure to it. “Maybe this would make into a good handbag,” I decided. I began playing with patterns and stitches and came up with a textured diamond stitch that I really liked. I finished the little clutch bag and sewed a lining a zipper into it (thanks Mom for teaching me to sew!) I put some makeup in it and tucked it into my larger purse and went about my business. Need a gift fast? Shop ready-made purses. That year, all the ladies in my life got a little purse as a gift. The next year, almost all of them called to tell me they loved their purses. They were pretty and practical, and they used them every day. Most of them then proceeded to ask if I would make them five or six purses so they could give them to their friends and family too. I began crocheting in earnest to fill orders. The requests kept rolling in and soon I had my own small business, purely by accident. I couldn’t keep up with the orders, so I wrote up the pattern and encouraged anyone who could crochet their own to try their hand at the making a crocheted purse. I now sell the purses at craft shows and online and they always do well. I also have more than 15 purse patterns for DIYers who want to try it themselves. People love them because they are so useful and durable, and let’s be honest here … they’re just super pretty too! If you’re looking for the perfect handmade gift to give away this year, look no further. Try one of these patterns! Available for sale here or on Craftsy, Etsy, and Amazon Kindle too! Click on a picture for more info about that pattern. Don’t crochet? That’s okay! I have some ready-made purses in a variety of sizes available in my store. The Tulips Coin Purse Pattern The Tulips Clutch Pattern The Tulips Purse Pattern Get all three patterns for one low price! Are you into your ereader? Do you like downloading books and articles to read on your phone app or tablet rather than having a paper copy? Well, Fun Crochet Designs is making the move to the ereader world! People who love their Kindles and Kindle apps can now download Fun Crochet Designs crochet patterns on their tablets and phones straight from Amazon! No more carrying around a paper copy of your crochet pattern, trying to keep track of pattern sheets, filing your patterns away in a dusty corner of your craft room. Now you can just open your phone or tablet and find all your creative goodies stored there! Click on a picture to view on Amazon! I love crocheting purses, but in the beginning, figuring out how to handle the handle was my biggest obstacle. I tried a few methods before I landed on this one and liked the results. 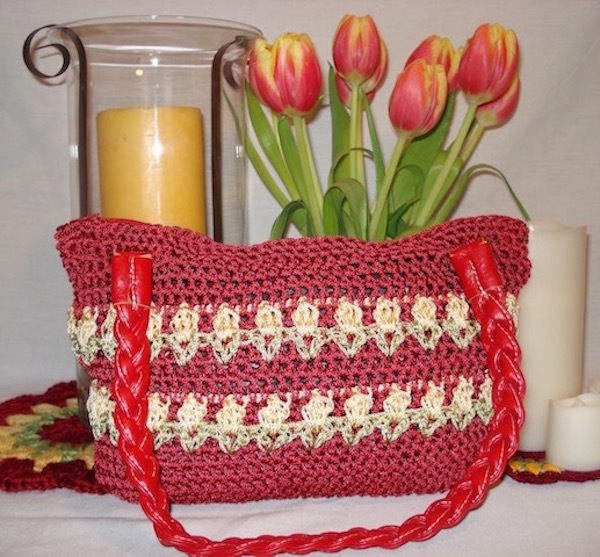 Adding a handle to your crocheted purse doesn’t have to be hard. You can crochet the handle yourself, or buy a store-bought version that you can easily incorporate into your project. Showing you seemed easier than trying to explain the process in words, so I created a short YouTube video for you to watch. Hopefully once you see how easy it is to do this, you will want to try crocheting a purse of your own! I have plenty of patterns for you to try! And don’t forget to follow my YouTube channel so you will be updated when I add new tips and tricks to help make your crochet projects great. Watch me crochet a handle into a crocheted purse. 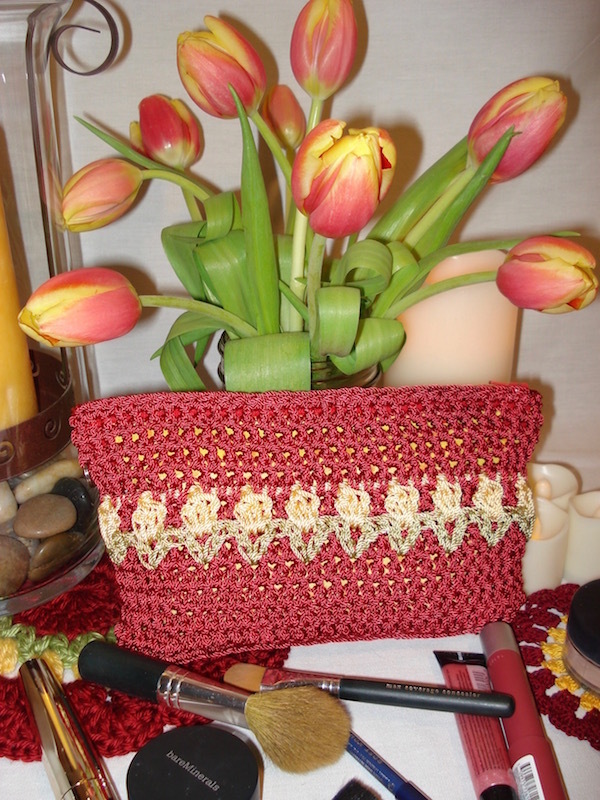 I love crocheting purses, and I am especially fond of the smaller coin purses and makeup bags. They are such a convenient size and I have found any number of uses for them over the years. One thing I have learned is that they can be very useful when I want to travel light, like on a shopping spree. I just throw my phone, a credit card, and a lipstick inside, zip and go! Originally, the bags were just little zippered pouches, however, over time I realized I could make them more convenient by crocheting a key ring into the design and making a strap I could attach to that key ring. This made them super easy to loop over my wrist and carry. I realize that those of you who have purchased my patterns might enjoy having a strap to carry your coin purse or clutch, so I’ve created a short video showing you how I macrame the strap from the leftover cord and a few pieces of hardware you can buy for 50¢ or so. It is perfectly coordinated with your purse and adds a whole new level of usefulness to your bags. Interested? Here’s a link to the YouTube Video! Be sure to follow my channel for more useful tips and tricks to make your crochet projects great! Watch me macrame a wrist strap for a coin purse or clutch. Last week we talked about the basics of reading a pattern. Just when you thought you were getting a grasp on the abbreviations and terms in patterns, the world goes and throws another layer of difficulty at you. Not all countries use the same terms to describe the same stitches. The US and Canadian patterns are basically the same, however, UK terms are slightly different. The easiest way to explain the differences is to show you in a chart. As you can see, the terms start out the same at the top of the list with chain and slip stitch called by the same term in both countries. But then the two lists diverge. The Brits decided not to include the term single crochet in their crochet dictionary, but rather skipped right on to double crochet. So, if you are from North American crocheting from a crochet pattern written in the UK, when you read double crochet, you actually want to make a single crochet. When you read treble, you are going to work a double. And so forth. Our friends across the pond must learn what a single crochet is and then do their conversions to US terms. While the conversion looks all clear and simple on the chart above, the execution of this feat is actually a little harder. The mental gymnastics involved in converting the terms as you go can be daunting, and you may find that more than once you forget to convert and use the wrong stitch. These mistakes will create some odd patches in your work if you do this too many times. If the pattern is not too complicated, like an easy one or two row repeat with just a few basic sts, you can probably get away with sitting a conversion chart nearby and referring to it often until you get the hang of the pattern and no longer need the pattern or conversion chart. For difficult patterns, you probably don’t want to spend days and weeks doing the mental gyrations necessary to crochet the pattern correctly. To avoid time-wasting, aggravating mistakes, I recommend you do some prep work before you begin your pattern. I print off the pattern or make a copy if it’s in a book, then use a bright-colored pen to go through the pattern and write the conversions over the top of the stitches that are different. I do all the hard thinking before I begin so I can relax and enjoy myself when I get hook in hand. That way I minimize mistakes and maximize the fun of working from a new pattern. It’s officially spring! I’m so excited. I live in the northern part of the US and it gets COLD and snowy and blowy in the winter months. Of course that makes for some great crocheting days when it’s too cold and nasty to venture out of the house. I sit by the fireplace and make all kinds of pretties. But I’m always thrilled when spring rolls around and the temperatures warm up and we can start looking forward to the appearance of the tulips. 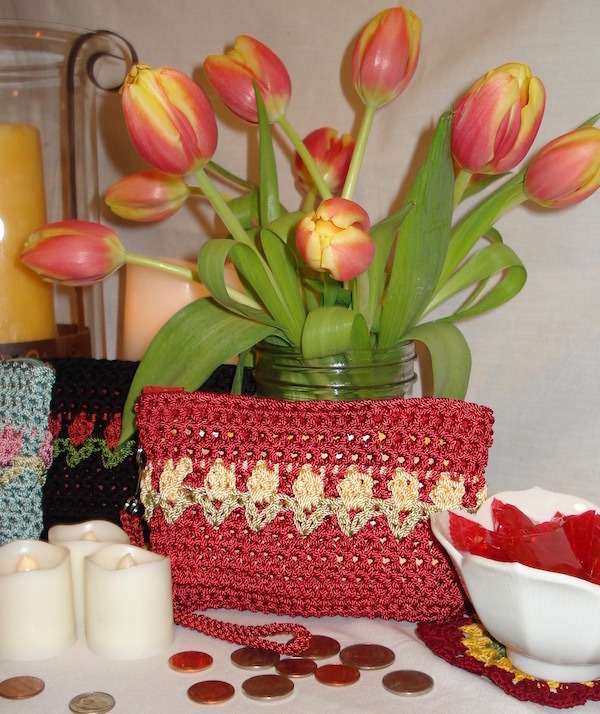 Speaking of which, I launched my Tulip Coin Purse, Tulip Clutch, and Tulip Purse patterns this week as well as a Layered Flower pattern to celebrate the onset of spring and the flowers that will soon appear. Check them out! Mother’s Day is fast approaching, and moms love flowers! Why not give her a flowered purse this year? I made a Tulip Clutch for my MIL last year on her birthday and she loved it! Okay, so our subject on today’s Tips segment is about reading crochet patterns. Crocheting is an art form that most of us learn from a friend or relative. It’s a skill that is easiest to learn if you have someone sitting beside you guiding you and showing you what to do by example. For those of you who learned to crochet from looking a pictures and diagrams in a book, I commend you! That is a feat that few are able to accomplish. Once someone has shown you some basic stitches and you have the general hang of the techniques, you might want to begin experimenting with different ways to combine stitches to build textures and patterns into your crochet projects. The best way to do that (without a lot of trial and error and frogging) is to follow a crochet pattern. But for most beginners, they pick up a crochet pattern and it looks like some kind of foreign language. All those abbreviations and symbols and repeats — they can make a person’s eyes go blurry while their brain twists into a pretzel. But it doesn’t have to be as painful as all that! When you first start working with patterns, I suggest you start with one that contains just a small handful of basic stitches and a pattern that isn’t too complex. And look for patterns that are from reputable sources. You can find patterns on people’s blogs and freebie sites online, however, not every pattern designer knows how to clearly write and communicate a crochet pattern. I have encountered patterns written by amateurs that even after 30+ years of crocheting I could not decipher because the instructions were so convoluted. Don’t frustrate yourself in the beginning. Start with a pattern that you know is well written. Once you know that sc means single crochet and dc means double crochet, you can read through the pattern and see that you are going to work a sc (single crochet) into the top of each dc (double crochet) across to the end of the row. When working through a new pattern, I often read the instructions out loud, substituting the full terms for the abbreviations. Finally, if you get stuck and can’t seem to figure out the next step, ask a mentor. If you don’t have one, pack up your crocheting and go to your local yarn store. Ask if there is someone who could help you decipher the pattern and show you how to work through the part that is giving you trouble. Often they will have an employee, or in a small niche store they might teach classes, and there will be a teacher or experienced mentor who can work with you. I had a mentor who taught a class through my church one year. She helped me take my crocheting to the next level. As I attempted harder and harder patterns and projects, she was always willing to help me through the more difficult sections. I just took my crocheting to church and sat down with her for a few minutes before or after the service. 🙂 I greatly appreciated Jeweldene and her willingness to mentor me! I’ve tried to pay it forward by teaching others to crochet and helping them learn to read patterns. If you choose to make a pattern with more complex stitches or specific combinations of stitches that are used in the pattern, the designer will often include a Special Stitches section at the beginning of the pattern instructions. In this section, the designer explains how to work through unusual stitches or stitch combinations. If you are a beginner, read these instructions carefully, and maybe even consider doing a test piece in which you practice special stitches before you begin your project so you become familiar and comfortable with the special stitches. Most importantly, don’t let crochet patterns intimidate you. With a little knowledge, help, and effort, you can be reading patterns and creating some amazing crocheted works of art! I LOVE tulips and I love crocheting, so imagine my delight when I discovered a tulip crochet stitch. It’s always amazing to combine two favorites, right? So I set out to find some ways to utilize this beautiful floral motif into some new crochet patterns and I’m thrilled to share the results with you in celebration of spring! Every time I look at these new designs, I smile. The flower designs are just so cheery and spring-like, you can’t help but want a whole bouquet of these fun patterns! Don’t miss the freebie offer at the end of this post! Crochet the perfect little zippered pouch to hold your coins or small items like chapstick, floss, and eyedrops. This coin purse tucks nicely into any size bag and helps keep you organized in style! Carry a bouquet of tulips with you every day of the year when you make one of these fun, floral coin purses to tuck in your purse. Finished purse measures 4″ x 6″. 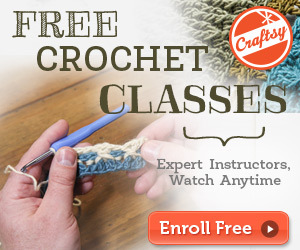 Don’t have the time or skill to crochet one yourself? No problem! I have some made up and ready to sell. Choose from seven color combinations. Click here to get yours today. Small enough to fit in another bag, but large enough to hold your phone, keys, and a small wallet, this clutch-sized bag is incredibly versatile and handy. Tuck it inside a larger purse to keep makeup and small items contained, or carry it as a clutch when you want to travel light. And who can resist the feminine floral design of this gem? Finished pattern measures 5″ x 8″. Would you rather buy one that’s already complete? You can! Just click here to choose your color and it will ship out tomorrow! 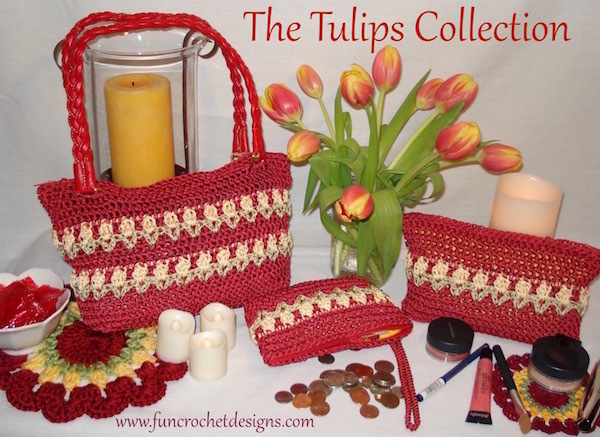 Carry a bouquet of tulips with you wherever you go when you crochet yourself a purse from the Tulips Purse Pattern. The pattern uses easy stitches and picture tutorials to teach you this beautiful stitch. Finished pattern measures 11.5″W x 7″H x 3″D. The “Tulips” Doily – FREE for a limited time! Add a touch of flowers to any table or surface with this quick and easy doily pattern. Made from leftover yarn, this is a great way to use up small amounts of scraps in your stash! This pattern is actually two-in-one … one version using size 4 worsted weight yarn, creating a doily 9″ in diameter that can be used under a large vase or lamp or placed on your dining tabletop as a hot pad. 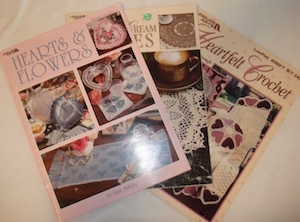 The other version gives instructions for #10 crochet cotton thread resulting in a delicate doily perfect for use under votives, candy dishes, or small vases. It takes less than an hour to crochet one of these doilies, so you can have one today! Request your copy below! You have a hook and some yarn, and now it’s time to start crocheting. One of the first things every beginner has to learn is how to hold their yarn. 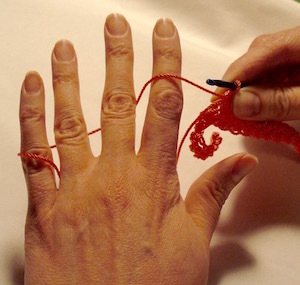 Before you begin, it may help to understand the purpose of threading the yarn through your support hand. In much the same way that you thread a sewing machine to create and maintain the proper amount of tension on the thread so that stitches are even as you sew, you thread the yarn through your fingers to create even tension on the yarn so your crochet stitches have a uniformity they would otherwise lack. This concept sounds so simple, however, in practice, I found it to be one of the more difficult aspects of crocheting to master. At first I crocheted so tightly I bent hooks. As I was trying to adjust, I then had patches that were tight and others loose, making my work look uneven. Finally, I settled into a steadier flow and my work became even and uniform. 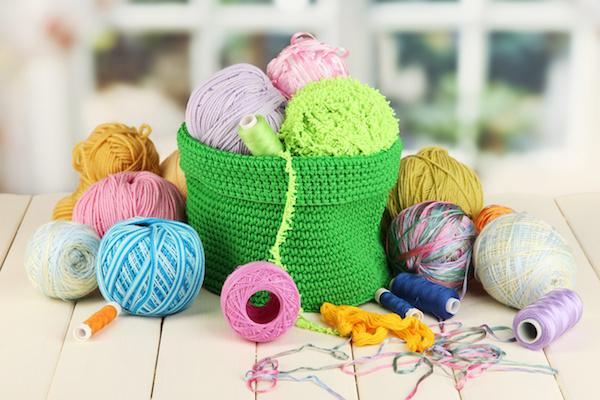 Finding that sweet spot can present a challenge for some crocheters, but here are some tips to help you adapt. There are a dozen ways to hold your hook and another dozen options for your yarn. I’m of the opinion that there is no right or wrong way, simply the way that works best for you. But if your way is creating too much or too little tension, try some of the other methods. 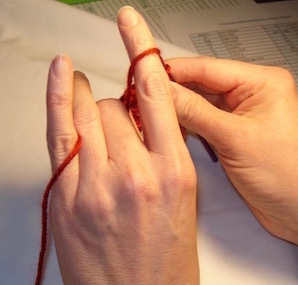 My teacher taught me to thread my yarn over my pinky, under the ring and middle finger, then over the index. But I found I wasn’t getting enough tension that way. With a little experimentation, I realized that I needed to change my methods a little to get the desired results. I now loop the yarn around my pinky so it does a full circle as it rounds that finger, then under the ring and middle, over the index. That creates a little more tension on the yarn that works for me. Do what you have to do to accommodate your crocheting style. Crochet with the same hook throughout a project. Obviously you want to stay with the same size hook throughout a project (unless the pattern specifies a change for a specific reason) but even a minor change in the hook can make a difference in your stitch. Once I start a project, I don’t usually put the hook away. I simply weave it into the project or skein of yarn and leave it with the project. That way if I get busy, I don’t forget which hook I was using and change mid-project. It really does make a difference. Sit in the same location if possible. I know it seems insignificant, however, changing where or how you sit when you crochet can cause variations in your crocheting. A chair with armrests might have you moving slightly different than a seat where your elbows are not propped. Leaning to one side or the other can limit or alter your movement, changing your stitches. Keep the lighting consistent as well, as this seems to have an impact on some projects. 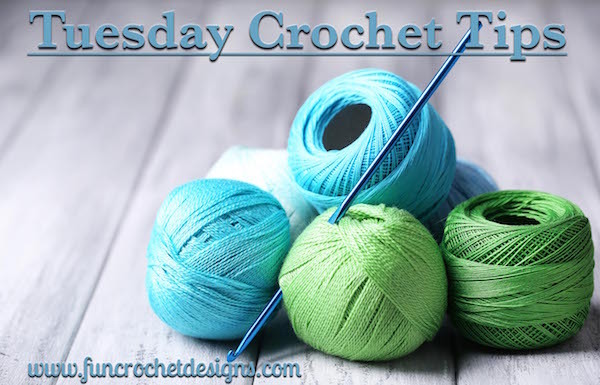 Overall, the best advice is to find the method that works best for you, then be consistent in how you crochet and that will help you achieve consistency in your work and stitches. It can take some time and you may complete a few projects before you start to feel like you’re learning to control your yarn tension. But don’t give up! Keep working at it and soon you will have beautifully smooth stitches with even tension. You’ve found a pattern you are excited about, and you are ready to get started as soon as possible. But you don’t have the yarn the pattern calls for. A visit to the store proves to be equally frustrating as they don’t carry the yarn the pattern calls for either. Can you substitute something else? This is a common dilemma that I run into when I set out to start a new crochet pattern. I imagine it happens to all of us from time to time. Over the years I have learned a few things about yarn selection and I will share a few tips today. The ideal yarn to use for any pattern is the yarn the designer suggests in the directions. Designers take many aspects into consideration when selecting a yarn. Body, drape, texture, sheen, durability, stretch, thickness, etc. Each of these aspects of the yarn has an impact on the overall project. Some yarns have a wonderful drape and make a great medium for a garment or soft baby blanket. Other yarns are stiff and have tremendous body when crocheted and are a better choice for items you want to have structure, like a crocheted basket or a heavy tote. Switching to a yarn other than the one the designer recommends could affect some of these aspects of the project. Size is another consideration. Every brand of yarn has its own unique thickness, and even minor variations can mean a difference of inches in the overall dimensions of a finished project. If you are crocheting a garment, you may need precise dimensions to get a good fit. But there are times you simply cannot obtain the yarn needed, like when a yarn has been discontinued. When that situation arises, here is what I do. Size: First of all, find a yarn that is that same size. All yarns are assigned a general size category. For example, most normal Red Heart yarn falls into the size 4 category. All yarns in a particular category are going to be close to the same size—not exact, but nearly. Content: Within that category, look for a yarn that has similar contents in its makeup. For example, if your pattern calls for a yarn with 50% wool, 50% cotton, look for a yarn that contains the same materials in equal quantities. Rayon, polyester, alpaca, and acrylic—they all have different texture, body, and drape. Choosing something of similar content will help to create an end-product that is similar to the designers. Gauge: Once you’ve selected a yarn you feel might work, take the time to crochet a gauge if size is going to be a factor in your project. Many patterns that are intended to result in very specific sizes or dimension in the end product will include a gauge in the pattern. A gauge usually consists of crocheting a certain number of rows or a smaller sample of the pattern and measuring the results. If your gauge does not match, you will be able to adjust your yarn or hook to obtain a better fit. I hope these tips will help you to select the perfect yarn for your next project. Until next time, I wish you Happy Crocheting!